HGL showed a long history of above-average profitability. It was trading close to tangible book value (TBV). Consumer sentiment had improved. HGL's financial result should catch up very soon. This week, HGL released its half-year result. It was essentially breakeven.The new CEO conceded the company required further cost cutting and announced new restructuring initiatives that would burn $1m cash and require a $3-4m writedowns of its asset in the 2nd half of the year. On the top of that, the management wanted to distribute $1m dividend. Last year the company paid dividends from the proceeding of the sale of a business unit. This year, it is going to pay dividends from its capital base! Now, examine the investment case again: Pillar #3 is broken. While the rest of the retail sector in Australia has recovered from it dark hours, no turnaround is in sight for HGL. Pillar #2 will be further weakened by the writedowns. When an investment thesis is broken, I exit my position. Without writing down why you buy a stock, when the fundamentals change, you won't notice. Human mind is an interesting thing. It's not good at remember things when the past is in dissonance with the new reality. It's very plastic. It will reconstruct a new history, making up a story to fit the new reality. It's so easy to fool yourself. In the case of HGL, I could've fooled myself restructuring were a sign of turnaround I originally anticipated. But, no, it wasn't. I was expecting a swift shift jump of profit. There is no way to hide the mistake when it is written down black and white. There is no "but" or "if". Regardless how painful the lost is, exit your position when the investment thesis is broken. The investment thesis that you have written will help you here to judge the situation rationally without being clouded by your emotion. HGL may eventually turnaround. There is always the possibility I'm missing the upside if I sell now. However, the key point is, I bought HGL because of the reasons I listed above. If they are broken, my downside is more risky than I originally anticipated. In other words, this is a matter of risk control. In investing, when you consider each individual action in isolation, good outcome doesn't necessarily mean good skills; likewise, good skills don't necessarily produce good outcome. I first read about the significance of having a good process in Mausoussin's More Than You Know . Source: Russo and Schoemaker, Winning Decisions. At the time, I thought it was BS. Ask me to condone bad outcomes?! The endgame is always about returns, right? 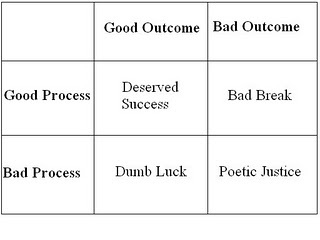 How the hell would the process be more important than outcome?! Yet, over the years, I gradually realised how fundamental and significant this wisdom is. I think the best example to illustrate this is poker game. Poker and investing are very similar. Both skills and luck are important factors. Say you are watching a player playing a poker game. If you saw him losing a few hands in the last 15 minutes, can you conclude he has no skills? Or if he has just won a few hands, can you conclude he has skills? Apparently not. The only way to tell whether a poker player is a master or not is to follow him for a long time. Only long-term result can separate skills from luck. And how does a poker master achieve long-term result? He sticks to a good process consistently and painstakingly to allow the edge of his skills to play out. Each individual hand may produce bad outcome. But in long run, his edge will generate better than average result. Look at the HGL case again. I lost 6% in this investment in real life. My original thesis estimated that the best case upside was 200%. So here we have a 30:1 reward-to-risk ratio. And I judged there was a fair chance the favourite case would play out. Asymmetric reward/risk plus favourable possibility. Even if it didn't play out this time, the decision to buy was the right one. So was the decision to sell. I'm thinking you have made another biggest mistake of the year. As Warren Buffett says if you cannot handle a 70% reduction in you shares then you should not be in the game. And you should also note that Warren Buffett's perferred holding period is forever. Your cigarbutt comment is frankly rude and dis respectful and should be removed. Loyal HGL shareholder, Buffet would have addressed the argument, and not play the man. How about you show the same courtesy? Useful post. Thanks fot it. Advices are nice. I'm now a proud part-owner of Apple, Inc. The content contained in this blog represents the opinions of the author. The author may hold either long or short positions in securities of various companies discussed in the blog and reserves the right to change his positions without any notifications. The commentary in this blog in no way constitutes a solicitation of business or investment advice. It should not be relied upon in making investment decisions. It is intended solely for the entertainment of the reader and the author. This blog is not directed at any persons for investment purposes. While every effort has been made to ensure information quoted from other sources is accurate, the author does not claim that the information is free of errors. (c) 2012 Portfolio14. Simple theme. Powered by Blogger.